Twitter Celebrates 5 Year Anniversary. Posted on 19th March 2011 at 09:56. 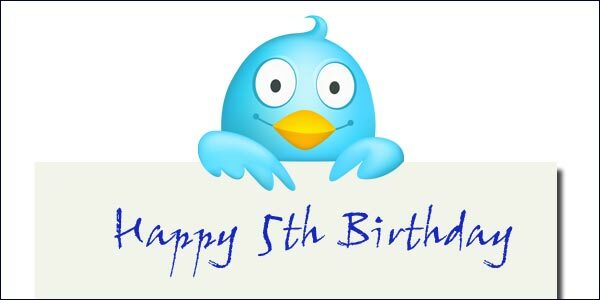 It seems hard to believe this, but Twitter is about to celebrate its fifth birthday on 21 March, 2011. Time really does fly, doesn’t it? I remember that first tweet by Jack Dorsey and being told to watch this space as Twitter was about to become the next ‘big’ thing. Like many, I suspect, I just thought oh good another social network – just another flash in the pan then. It only goes to show how wrong you can be. In just 5 short years Twitter has grown from a fledging social media platform to the eleventh most popular website on the internet. That’s astonishing when you think about it. The obvious question to ask is why, what’s made this platform so spectacularly successful? Before you can even begin to attempt to answer that, you really need to get to grips with some of the facts and figures involved in this meteoric rise. The average number of tweets sent per day in the last month is 140 million according to figures released by Twitter: on March 11 alone 177 million tweets were sent. Every day 460,000 new accounts are created, and in the space of just 1 week users will send over 1 billion tweets. The numbers are absolutely staggering, and there’s little to suggest that the rate of growth will slow down in the short or longer term. So why is this? What’s so special or different about Twitter that sets it apart from other social media platforms? If I knew the answer to that I’d be a very rich man. The truth is there isn’t a single, simple answer. Twitter came along at exactly the right time and succeeded because it offered the public precisely what it wanted at a time when internet and mobile phone usage was increasing dramatically. It’s different because offers a unique service to the social networking world: it allows you to communicate with friends and followers concisely and in real-time. Limiting updates to just 140 characters focuses the mind and the finger. These updates have a sense of immediacy that other platforms can’t match. Yes you can use status updates on Facebook, but it just doesn’t feel the same. Twitter speaks to a very broad audience. It’s no longer simply a personal networking service, but has been embraced by the wider business and marketing community. It’s already been used in space and in search and rescue, and is increasingly becoming an invaluable tool with the power to bring about both social and political change: you only have to look at the impact it’s having in Libya at the moment to see just how influential it is. It’s an instant form of communication that can’t easily be controlled or suppressed. Is it any wonder autocratic states and dictators fear it? There’s little doubt that Twitter will continue on this upward curve in the next five years. Barring some unmitigated disaster it will continue to develop and expand. Whether that will be at the same rate is open to debate. Then again, I didn’t think it would take off in the first place, so what do I know? Google – Content Farms – The Bottom Drops Out Of The Farmer’s Market.Yo! Sushi Sign Up To Facebook Deals Promotion.